The MyStarSound Pro Series instrument/guitar cable is a quality, cost efficient cable choice. Because the Pro Series cable is manufactured using our finest 20-gauge, 41 strand copper conductor cable it provides the ultimate fidelity. A 95% spiral shield protects from outside interference and ensures a pure signal. Covered by MyStarSound’s TPE outer jacket, this professional grade cable stands up to the rigorous demand found touring, and still remains flexible. Roll out your cable easily right out of the tour case! Amphenol connectors come standard with sealed ends and your choice of colored & personalized heat shrink. 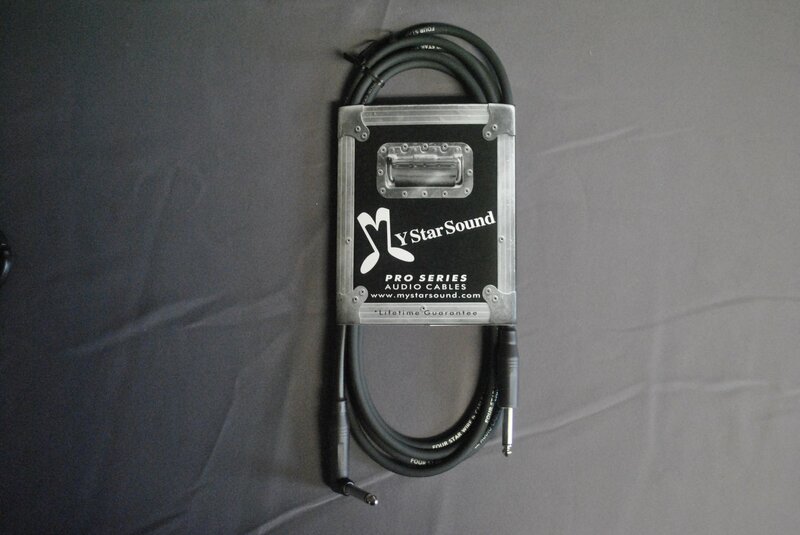 All MyStarSound Pro Series cable is covered by our lifetime warranty and can be ordered with your choice of connectors. 1/4 -1/4 10FT with one Right Angle.